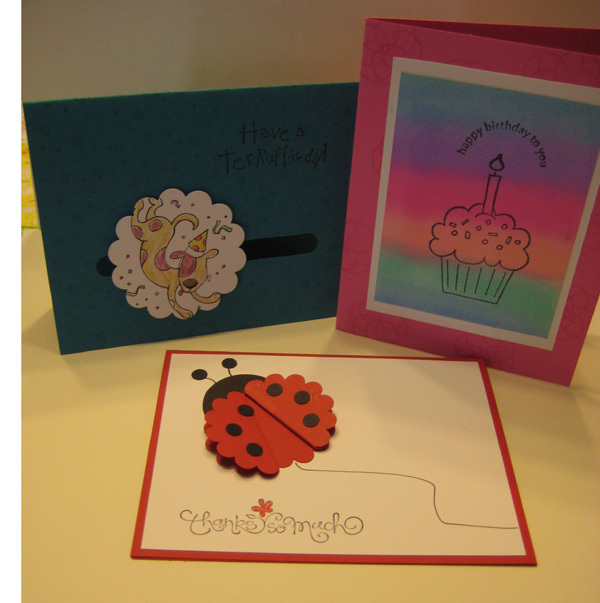 This was a card swap from convention that I made with my stamp-a-stack ladies and also made it with my College for Kids classes. 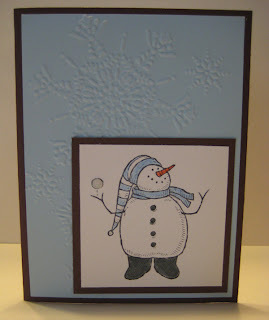 We did more layers and dots with the adults, but this one truly can be for anyone of any age! 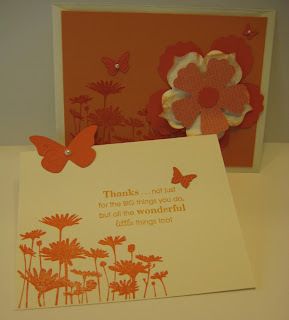 The original artist didn't sign her swap, but I can tell you it has been popular with the stampers that I know! This card was inspired by a gorgeous card demonstrated at convention by Mary Ellen Byerly. I finally broke down and bought the Beautiful Wings Embosslet Die after seeing her demo. 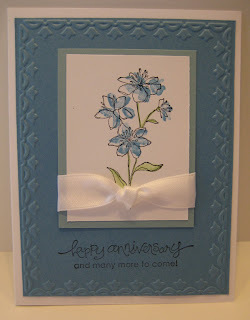 I have always liked it and cards made with it, but I try (notice I said try!) not to buy everything in the catalog. 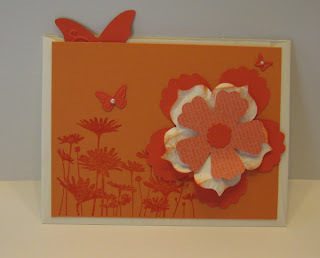 I changed colors and stamp sets but the butterflies are what make this card so those were a must. The card is made with an envelope with the flap cut off and the biggest of the butterflies is your pull tab. Love it! This was a fun card to try. After doing a "regular" easel card with stamp club some time ago, I was inspired to try a round one. And what better than to do a sunflower? 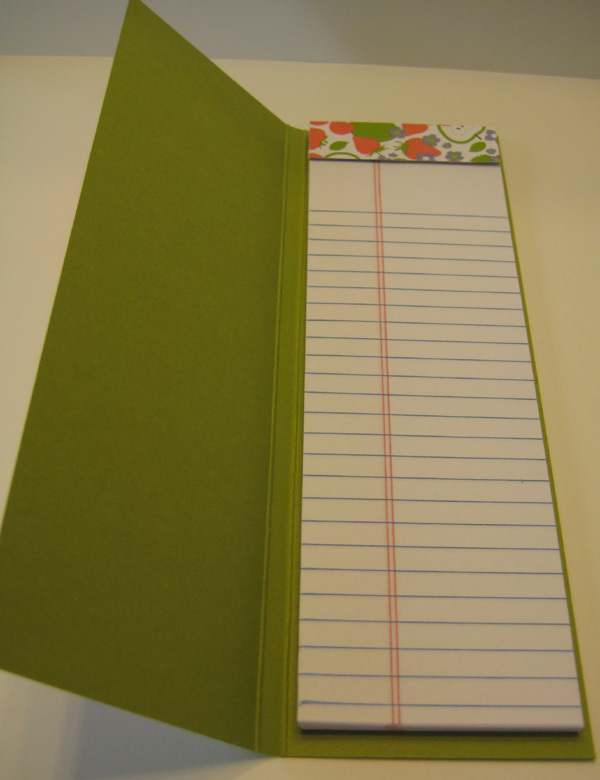 Just fold your cardstock like a card, but when running it through the Big Shot, don't place the fold up far enough that it will be cut. Fold the top of the card back and then you make a single white scallop circle to attach to the top. 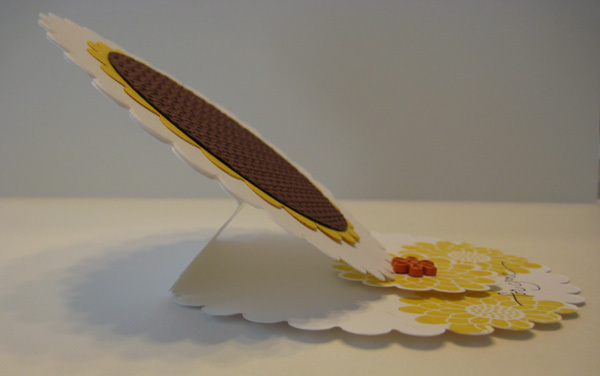 I included a sideways view so you could see how the fold makes the card work. 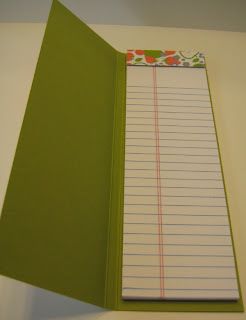 Now that it is back to school for most everyone, this skinny notebook is most appropriate. I didn't really set out to make it a "teachery" theme, but I was using the Berry Blossoms Designer Series Paper pack and Fruit and Flowers stamp set and this is what this teacher gravitated towards. 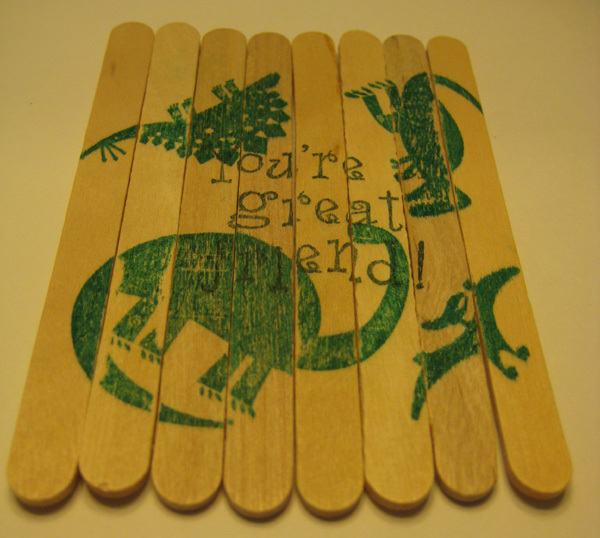 I cut several different papers from that set so the stamp club ladies could do something else and there were a lot of great combinations. At my August Stamp-a-Stack, I planned to do 3 of my favorite convention swaps. While I came home with nearly 100 great cards, I remember seeing this color combination of Baja Breeze and Marina Mist with this flower from the Simply Soft hostess set in one of my friend's stack of swaps. 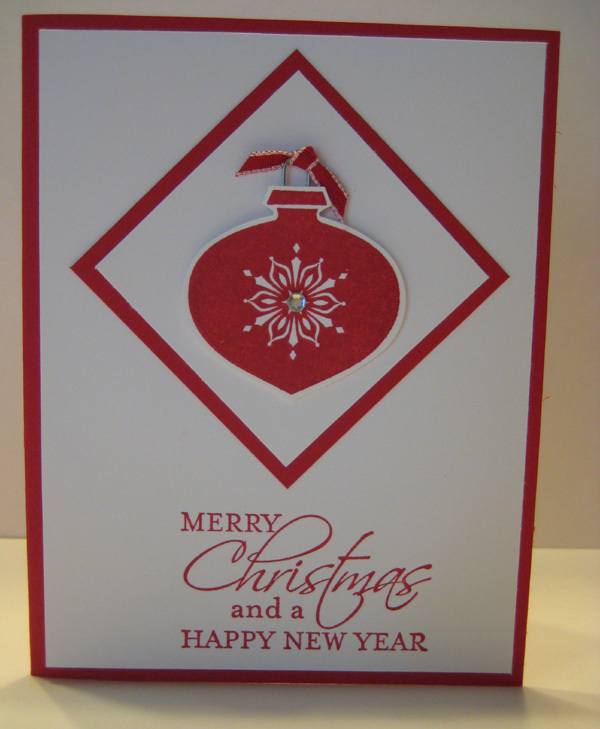 So sorry to say I can't give credit to the original designer of the card. I made a couple of slight changes, but as you can see, her card was just beautiful. 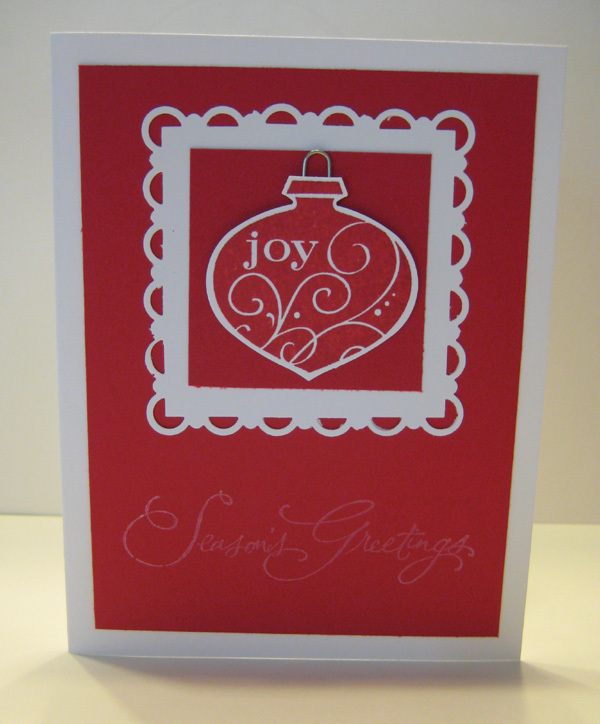 When I first started stamping, I learned the Polished Stone Technique, but it involved felt, a block of wood, metallic markers and reinkers. Now it is sooo much easier. Dampen a cotton ball with rubbing alcohol and then dab the cotton ball with Shimmer Paint (I used Champagne) and a few drops of reinker. 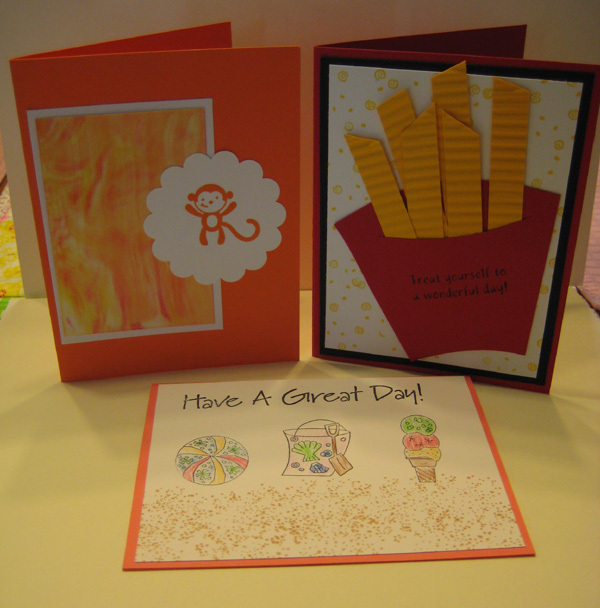 Dab onto glossy cardstock and voila - you're done! 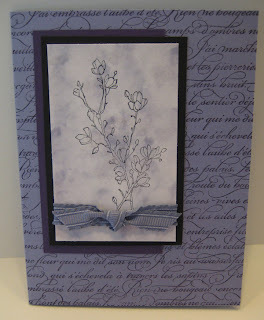 This card uses Wisteria Wonder reinker, but it is possible to use multiple colors. It just takes a few minutes to dry and then you can stamp over it with StazOn. 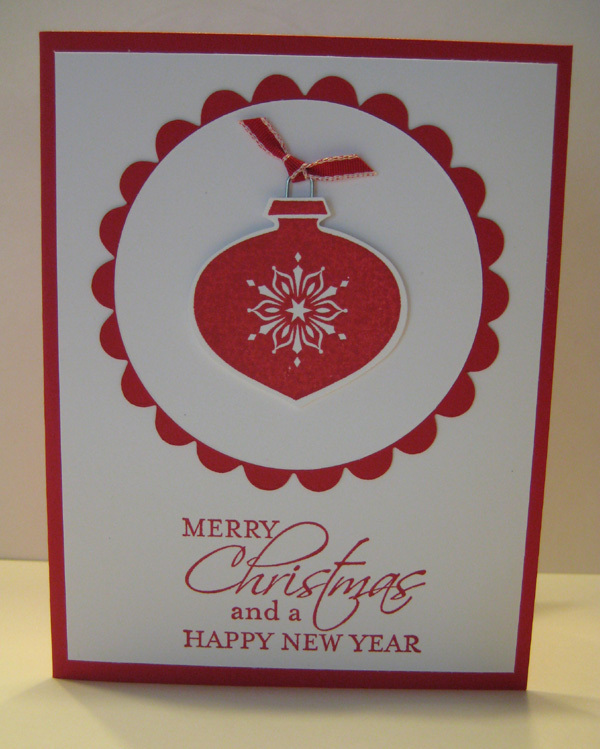 Here are two other versions of the red and white Christmas card. Neither of them were just right for the Christmas Stamp-a-Stack but I like them both and someone on my Christmas card list will be getting them this year. 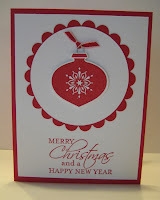 I have done a couple of events and a swap since Christmas in July so I promise some more new pictures soon! Here's the last of the Christmas in July cards, but you may still see a couple of versions of this card before I came up with the right card. A 99 cent box of paperclips made all the difference. 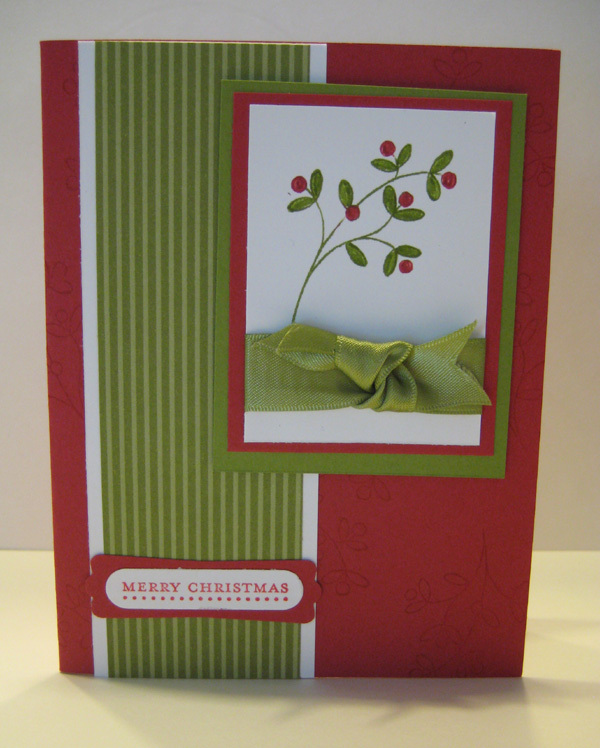 Here's another of the Christmas in July cards we did. 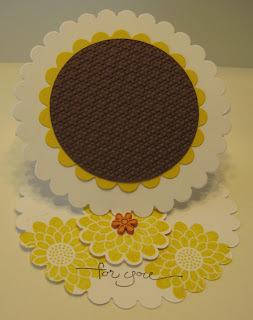 A fellow demonstrator had this great Bashful Blue and Chocolate Chip swap at convention. I am afraid I can't give appropriate credit because I saw it while flipping through her pile of swaps. I loved the color combination and recreated it when I got home. Here is one of the cards we did for my Christmas in July Stamp-a-Stack. I was inspired by a card on the display board at convention featuring one of the new stamp sets we convention attendees received free. Easy Events is going to be a great all-purpose set! Here is another batch of favorites. The crimper was a fun tool for the kids to use, and they liked choosing their stamps and coloring the beach scene. The orange card used the shaving cream technique. We waited until the last day to do that one, and it was one of my favorites because of the reactions to each and everyone's piece of glossy cardstock being pulled out of the shaving cream. No two were alike! 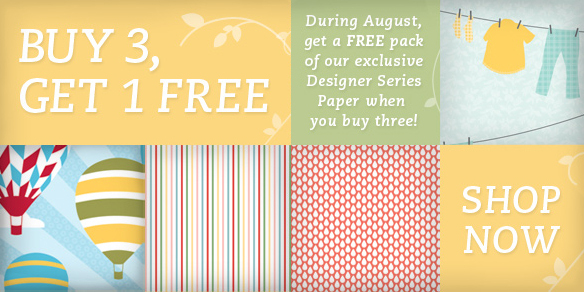 When you buy 3 Designer Series Papers ($10.95 value), you get 1 free! 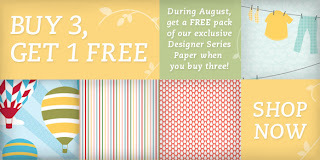 Find the Designer Series Papers on pages 185-186 in the Idea Book & Catalog or page 8 in your Summer Mini Catalog. Here are a few of the favorites of the kids taking my Card Construction class at the Lincoln Land College for Kids. 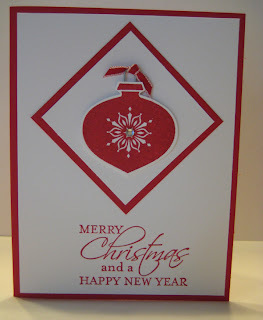 The spinner card was actually like the one voted as favorite the year before. 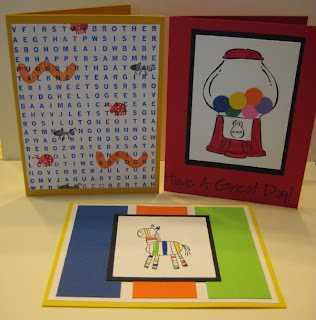 But the classes this year were all over as far as their favorite cards. 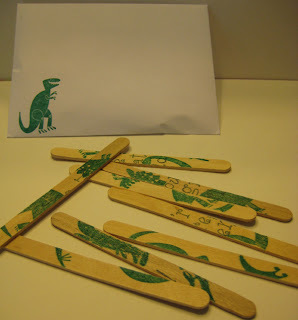 I used a lot of retired stamp sets and inks just in case, but I find the kids are usually very good about handling my things carefully... they just might be a bit more fingerprinty than adults. The kids don't seem to mind getting ink on themselves! 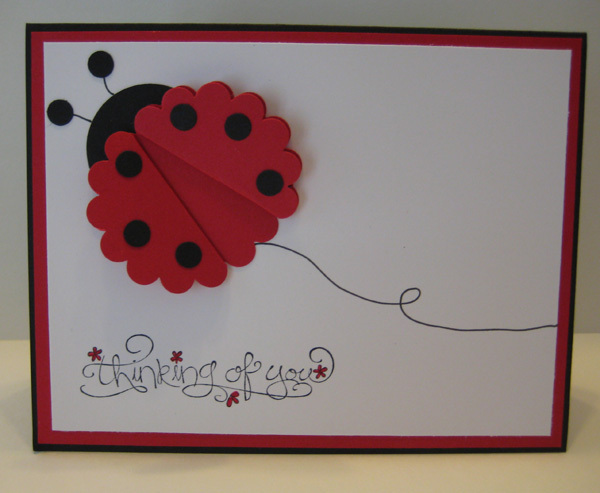 The ladybug card is a modified version of a swap I just got at convention this year. The stamper who made it didn't put her name on it, but I thought it was a great way to make a quick cheerful card.